There's some good info in this thread about our PHRF. Reviving an old thread— I’ve read the linked one above as well. We’re racing a 1988 37-2 in the Tampa area (Davis Island YC) and inherited an insanely fast rating of 114 (111 when I add a sprit) and we’re just getting killed. Part of the problem is that the previous owner had really good and consistent crew and did a number of mods to the boat over the years and the rating was gradually whittled down to where it is now. Of course, I made it worse by adding the sprit for distance races and flying an a1 kite.. The mods include the taller mast, faired bottom and when the skeg was lost during a race to Mexico he had the rudder built up forward by 20% which greatly neutralized the helm. Still, this rating consistently knocks us out of competition in local races. We frequently race short-handed (rarely more than 4) and also a lot of the time double-handed with my wife. I’m going to appeal this with West Florida phrf, but need some numbers. Could anyone please give me your rating if you race your 37-2? Any help would be most appreciated! Still got killed by a Ranger 29 every time. I could barely see him behind me when I crossed the line. He beat me by 2 minutes. Any day without dock lines is a GOOD day! I'm PHRF Non Spin 153 on Chesapeake Bay with roller furling, CB and folding prop. We do all right in non spin. I missed your post until now. US Sailing posts all PHRF ratings for all regions with the number of boats for each handicap. PHRF benchmarks off known constants like the J35. I looked at the spread for the T37-2 and there is a PHRF area in North Florida with a better rating than we have in WFPHRF and I think the other is in the Chesapeake area, but most are what we have or slightly lower. 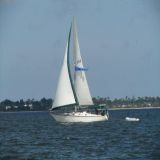 Up until a few years ago, Racer Cruiser class (sym spinnaker) received credits for cruising gear - then that was removed. The difference between my Racer Cruiser rating and Cruising is 59 sec. which is huge. Non-Spin doesn't get the Cruising credit either and the gutted boats on Thursday nights can't be touched. In Cruising class with a cruising chute (no pole allowed) I get half penalty of a chute (about 14 sec) and when the wind is beam to broad it's a good rating for my boat. That was the combination that won a 1st and 2nd in the Ft Myers race. My bottom is not race smooth so unless the wind is 12k or more, we can't get going. If someone had a T37-2 prepared like Martin had yours, he could sail that rating, but if taking a casual approach to Thursday nights, my 135 rating isn't enough to be even close.